We don't run because it's easy, we run because we get it. Those who don't get it joke that the only time you would catch them running would be to the refrigerator or from a grizzly bear but never to just get in a run. As we layer up and head out on a snowy day with an icy headwind, our neighbors are sure to be shaking their heads and wondering if we have lost our sanity, especially if we crack a smile... a smile that comes because we understand that the reality is a run like this is saving our sanity, and yes, can be just plain fun. Randy Step, an admitted obsessed runner, laughing all the way. PS: Speaking of laughing... Join us for our FIFTH ANNUAL Thirsty 3 Series! This not-so-serious racing and drinking series takes you on a tour to our favorite local beer, wine and hard cider facilities! Get your beer on at the Hightail to Ale 5K on May 11, 2018 in Detroit, MI, Your wine on in Jackson, MI on August 18, 2018 at the Running Between the Vines 5K, 5 Mile and Half Marathon... and then make the trip to Flushing, MI on October 7, 2018 as we SKEDADDLE for HARD CIDER at the Scrumpy Skedaddle 1K, 5K and 10K! PRICES GO UP DECEMBER 31, 2017 AT 11:59PM! From Turkey day to New Year's Day, our daily run is getting attacked from all sides, from endless parties and treats, finding time to shop, bad footing, wind, cold, short and dark days. Yikes! This is no time for running heroics and goals that may be doomed to fail, it's time to hunker down and just commit to the basics. Promise yourself to just get out the door for a minimum number of days for a minimum number of miles, something realistic, just enough to take in some fresh air and jiggle the fat. We can come back in January without too much erosion of our base, ready to ramp up to greatness! Run off what you can today, we'll burn the rest in January! Randy Step, an admitted obsessed runner, sharing what for me are rare, realistic thoughts about the daily run. Dang. PS: HO, HO, GO! There is one last chance to run with us in 2017. Join us Saturday evening, December 9, 2017 at the Holiday Hustle 5K and 1 Mile in Dexter, MI! A festive fun run full of flashing flare and jingle bells you wont want to miss... Online registration closes tomorrow, December 7 at NOON! PS: We're ramping up your 2018 running year over here at RF Events. Most recently opened? Our grooviest race of all! 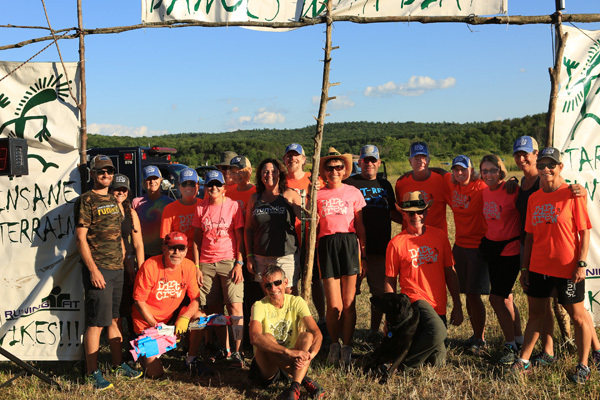 Join us for 3 days of peace, music and running at Run Woodstock on September 7, 8 & 9, 2018. Distances from 5 Miles to 100. Campsites are going fast so get in while the getting is good... and start the training in January ;). PEACE, MAN! I'm writing this by a roaring fire in a hostel perched at 13,000 ft on the rim of a volcano in Ecuador. Yesterday's 8 mile trek with 3,700 ft of climb got me here, made possible by my daily run. Our daily run will insure a fitness level that will prepare us for adventure when the opportunity arises. 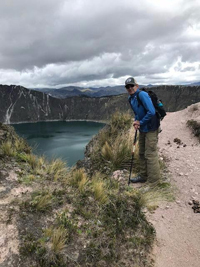 What I am experiencing while I trek through the Andes is not accessible to the average sedentary American. Another thought... the running lifestyle, finds us at times changing in our cars, or relieving ourselves in the facilitrees, these aspects of our play prepare us for adventure travel. Randy Step, an admitted obsessed runner ... Who is actually "running" very little this week, ha! PS: Join us for an all inclusive running adventure and escape the cold this winter with the Dirt Crew! Mark February 16-23, 2018 on the calendar, head to THIS LINK to book your spot and you'll be on a direct flight to NOW Jade in the Mayan Riviera in Mexico in no time! Daily optional runs, Jammin' 5K & 10K, daily active schedule and more fun! PS: 'Tis the season to give back! We're looking for volunteers to HO, HO, GO and help out with us at the Holiday Hustle 5K in Dexter, MI on December 9! Volunteers receive fun and festive flashing flare, a $30 voucher towards a future RF Events' Event and more! Check out volunteer opportunities here. 2017-11-22 - Thank you for running! Feeling grateful back here at RF Events' headquarters as we come into the home stretch of the event year. We can't thank you enough for your support of our events and making it possible for us to live out our passion. To thank you for your loyalty, we are very excited to reward you in 2018 and beyond with our "Run More, Earn More" program, where you will get a $20 event credit for every $150 spent on event entries. It's a simple program with nothing to do on your part, we'll keep track, just run any event on this list and earn! More runners will line up tomorrow to run in a race than any other day of the year! The Turkey Trot is a wonderful, fun, family, fitness tradition that lets us earn our spot at the table and on the couch. Weather you run in Downtown Ann Arbor, Detroit or in any of the other thousands of Turkey Trots across America, you will be setting a fun, fitness example those on the sidelines, perhaps creating the spark and giving the gift of running to others. Randy Step, an admitted obsessed runner who just loves Thanksgiving day. PS: Because of your support, we have made donations from the bottom line of our events this year to: Karen's Trail, The Detroit Riverfront Conservancy, The March of Dimes, University Prep High School of Detroit, The John Rogucki foundation, C.S. Mott Children's Hospital Save a Heart Program, The Novi Youth Council, The Ice Age Trail, The Riverland Conservancy, Angleman Syndrome Foundation, The Leukemia and Lymphoma Society, The Pinckney Trail Riders Association, Jackson Christian Athletics, Dexter Senior Center, Faith in Action, The Boy Scouts of America and many other worthwhile organizations. We especially thank those of you who made thousands of dollars of additional donations to these great organizations, you are amazing! Most of us spend more time indoors when the weather turns cold. This is one reason we can appreciate running even more in winter, the daily run gives us a chance to spend quality outdoor time. Yes, we need to have the right equipment but with today's tech gear, it takes very little. A couple wicking layers, some outer layer to cut the wind, hat, gloves and perhaps a bit of shoe traction and we can run as far as we are fit to go! I'll see you out there, let's give each other a thumbs up and a wave! 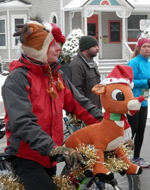 Randy Step, an admitted obsessed runner who admits to not being a fan of winter, but a fan of winter running. We can't dress for the heat but you can for anything else mother nature throws our way! PS: 'Tis the season to give back! We're looking for volunteers at a couple of our upcoming events. Gobble along with us at the Ann Arbor Turkey Trot on November 23rd or HO, HO, GO at the Holiday Hustle on December 9 in Dexter, MI. We've tons of fun positions available! PS: GOBBLE GOBBLE, TURKEYS! 7 days to Thanksgiving! Hit the pavement with us at the Ann Arbor Turkey Trot 5K and Tot Trot 1K. This festive fun run is a great way to start your Thanksgiving day and get you in the turkey mood! Shirts to all entrants, medals to all finishers. 2017-10-25 - We fight back! 2017-10-18 - With a plan,yes, you can!